In the early days of machine drilled wells, the wellhead was located underground below the frost line to avoid water supply lines freezing in colder climates. Often a well pit would be constructed around the wellhead to provide access for routine well maintenance, but sometimes the wellhead would simply be buried with no easy access point. 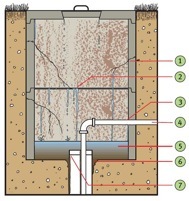 Well Pit – 7 Paths for contamination. Both situations came with serious potential drawbacks. In the case of a well pit (pictured to the right), an access cover can deteriorate over time, turning it into a hidden trap for animals, farm equipment, and small children. In addition, the concrete well casing around the pit can become cracked, trapping surface water on the inside. This increases the chance of the well becoming contaminated with surface water, either by failure of the watertight cap, or an improper seal farther down the well. Underground gasses can even become trapped inside the well pit, making it a dangerous place to work, even for professionals. When the wellhead is buried, it becomes just as susceptible to surface water contamination as one housed in a well pit. Even worse, there is no easy way to access the well for routine maintenance or emergency service. As any homeowner knows, critical parts of your house tend to fail at the most inopportune times. It can be difficult enough to locate and unearth a malfunctioning buried well during the warmer months; imagine how time-consuming it can be when the ground is frozen! Fortunately for us, a simple yet elegant solution was conceived that has made these issues obsolete. 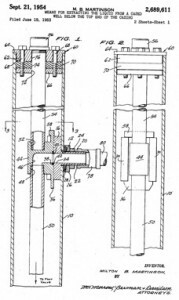 On June 19, 1953 a man named Milton B. Martinson filed a patent with the U.S. Patent Office that would modernize well installation and make life easier for well owners and service professionals alike. He saw the flaws inherent in well pit installation, and came up with a “means for extracting the liquid from a cased well below the top of the casing” in its stead. Later known as the pitless adapter, Martinson’s basic design remains in use to this day. Original patent for the pitless adapter. Thanks Milton! 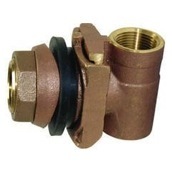 The primary function of the pitless adapter is to provide a junction for the drop pipe in the well to connect to the water line running to the house. 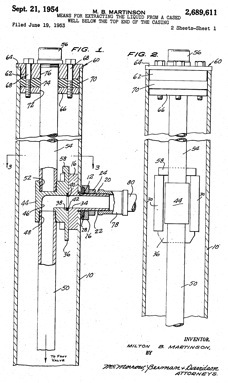 As you can see from Martinson’s original patent diagram, the main modification with the pitless adapter is that the drop pipe exits through the side of the casing rather than through the top. This is a fundamental design difference in and of itself- however, there are a number of improvements that in total make the pitless adapter a revolutionary addition to well technology. First and foremost, the side exit allows the wellhead to be extended above ground. Not only does this greatly reduce the chances of surface water contamination through the top of the well, it provides an easy point of entry for well maintenance. If the area around the well must be excavated, the wellhead provides an excellent point of reference to avoid damaging the existing well components. Pitless Adapter – exploded view. 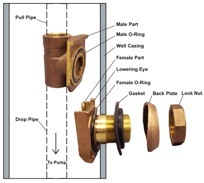 The male-female design of the pitless adapter makes it relatively easy to work on the interior components of the well. By screwing a tool called a t-bar in to the threaded top part of the adapter, the drop pipe, wire, and submersible pump (or jet assembly in the case of a jet pump) can be removed from the well without compromising any parts of the existing installation. When you are done, the male piece slides right back in to the female piece! Other forms of maintenance become a breeze compared to working on an underground wellhead. Video well inspections can often be performed with little preparation- saving you money. Well chlorination can be easily performed from the top of the well. As a savvy homeowner, you can even do this yourself. Ka-Ching! My well is underground. What do I do? I’m glad you asked. If your wellhead is located inside of a well pit, you’re in luck. The well pit makes it easy for a well professional to extend the well casing and install a pitless adapter place of the existing well seal. Afterwards, an earthwork professional simply fills the well pit with clean fill. If you’re wellhead is buried, the process becomes more time-consuming and expensive, mainly because the well must be located and dug up. It can be tempting to have an earthwork professional begin digging where the well is presumed to be, but in my experience the well is usually not located exactly where you think it is. The costs can add up fast, as the digging must be done carefully to avoid damaging the existing well structure. Even still, it is sometimes unavoidable, creating more work to be done. It can even become dangerous if you run into existing power lines. Don’t worry though; this is where a utility locating company comes in to play! A utility locating company can pinpoint the location of your existing well structure and waterline with surprising accuracy. This drastically reduces the time spent excavating the well, saving you money. The locating company fishes a tracer wire through the waterline until it stops at the elbow fitting on top of the well seal. They then use a magnetic detection device to trace the path of the waterline until it stops at the location of the wellhead, marking it for the excavator. Dig Safe can locate underground utilities, making the job safer for all of those involved. Here in Maine, I rely on Centerline Utility Locating any time I need a well located. I think its safe to say that the pitless adapter truly revolutionized the well industry. If your well doesn’t have one, I strongly urge you to contact us to have your well modernized.